The 2019 Summer Arts Festival will be held rain or shine. Artists on the Bluff 2019 Summer Arts Festival is an independent outdoor art show highlighting local artists. 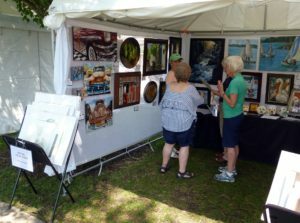 Artists on the Bluff welcomes all fine artists who live within a 100-mile radius of Lake Bluff (members as well as non-members) to apply to participate in this annual event. 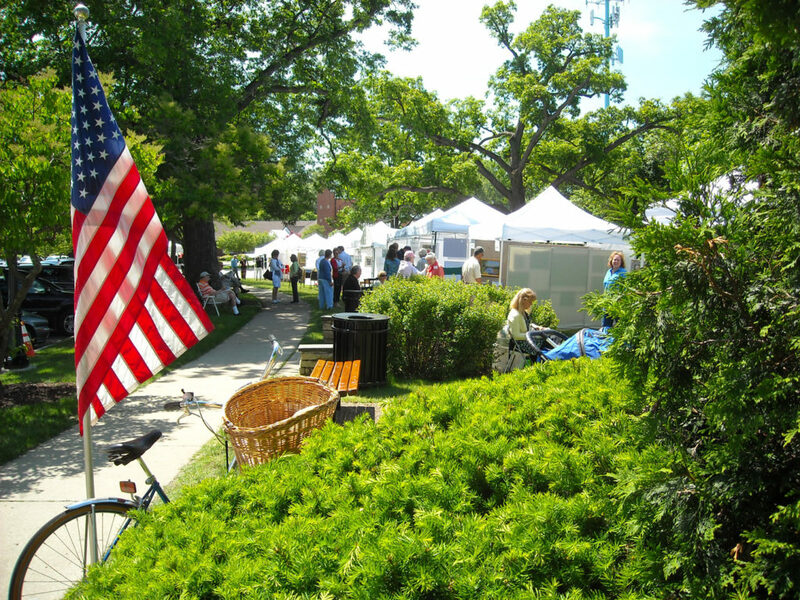 Held June 15 & 16 on the Village Green in Lake Bluff, with live entertainment, food, and a children’s crafts tent, it will be a lively community event. 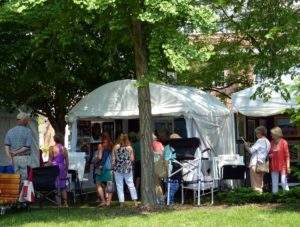 Artists will be notified of their acceptance into the 2019 Summer Arts Festival via email by April 20, 2019. The 2019 Summer Arts Festival will be held rain or shine. There are no refunds and no alternate rain dates. Application due date for AOTB Members: March 15th, 2019 and for Non-members, due date is April 10th. The following info is not yet available on this website: About and Apply for the 2019 Summer Arts Festival. Please use our contact us form for more information. Please note: No commission will be charged on sales for this event. Individual artists are responsible for reporting their sales as required for tax purposes. 1. The 2019 Summer Arts Festival will be held Saturday, June 15 and Sunday, June 16 from 10 am-5 pm. There will be no refunds or alternate rain dates. 2. Artists must display in tents and are to supply their own 10’ x 10 ‘ white tent and all display boards, tables, chairs and panels needed to exhibit. 3. SET UP Set up from 7-9am each day. 6. An artist may share his/her tent with another showing artist, but artists are jointly responsible for the application fee. Please notify us if you are sharing a tent, or would like to share a tent with someone and we will see if there are any matches for your request. 7. No mass-produced work and no work from kits will be allowed. All work exhibited must be the creation of the exhibiting artist. 8. Some work may be in whole or part a reproduction of artist’s original work. Not more than 50% of the work exhibited can be reproductions. 9. Artists on the Bluff is not responsible for damage to tents, artwork or displays caused by wind, inclement weather, vandalism or accidents of any kind. 10. Each artist will be responsible for their own change, so please bring cash and a credit apparatus if you accept credit cards. 11. The tax in Lake Bluff is 8.0%. Each artist is responsible for collecting and paying sales tax. 12. Artists setting up after 10 am or breaking down before 5 pm and/or not adhering to the rules may not be eligible to participate in the festival in the future. 1. If you would like your artwork to be considered for promotional materials, please submit up to 3 high-resolution digital images to: aotbfestival@gmail.com. Please include: “2019 Arts Festival Images” in the subject line of your email, and include your name and contact information. You will be notified if we use your artwork. Artists agree to grant permission to Artists on the Bluff to use their images for promotion but retain full copyright. 2. We invite you to become a member of Artists on the Bluff. The Membership Application form is available on our website, https://www.artistsonthebluff.org/join-league/, or at our events. For more information, please contact us.